1. Support your local farmer and your country! plastic wrap to swell...but it looks fresh? 3. The Coopworth & Jacob breeds are delicious - very lean & mild in flavor, not "gamey" as most that makes that " trip across the ocean". Sausage/5 kinds ( mutton from our farm). 1 lb. packs @$11/lb. Breakfast Sausage - A mild sausage that contains sage, salt & pepper. A delicious blend of "southern"
Zesty Italian Sausage - This seasoning blend holds the flavor of a delicious Italian Sausage but not hot. A great balance of fennel, black pepper with a hint of anise and garlic! * I have whole lambs at this time "ready to sell", call and I will give you the hanging weight and the specific cuts. The leg and shoulder will be with or w/o bone. The loin will be in chops and will have 2 per pack. Most of the ribs will be in French Cut Chops w/4" bone, although I may have some rib racks w/4" bone in retail. The breast will either be ground or in riblets and you will have several packs of ground lamb, packed in 1 lb. packs. The shanks are whole and usually 1 per pack, this is to allow a 1/2 lamb to be ordered. Call for information and prices based on the hanging weights that are available, thank you! Fantastic for grilling all year! the sirloin is part of the leg. Many of us have not been raised on a farm and are not familiar with the specific cuts of any meat, we are too use to a simple trip to the local grocery store! 1. Decide whole or half lamb order. 2. 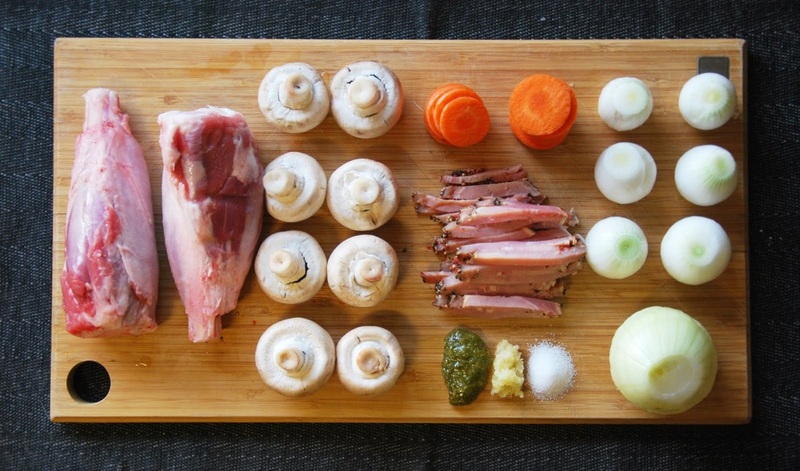 Choose specific cuts/each section. *Available hanging weights (the weight of the animal as it is hanging in the refrigerator waiting for the order to cut & freeze. *Average hanging weights are 40-50 lbs. The span in weight covers our smaller Jacob sheep & the medium Coopworth sheep. 1. Decide if you want to order a whole lamb or a half lamb. 2 brown paper grocery bags or one standard freezer shelf! 3. Do not get confused & think of a steer w/your lamb order! *I guarantee that each cut will be vacuum sealed & frozen, I inspect each cut for each lamb! and raised on this farm - to hopefully lead to additional orders! may want to have a lamb for next winter, to make sure that all have not been sold and place it "on hold" with a deposit. Please contact me & learn the specifics of "placing a lamb on hold", I look forward to hearing from you! and seasoned with herbs or a roast (w/or w/o bone) and marinated in the fridge prior to grilling or roasting - delicious! 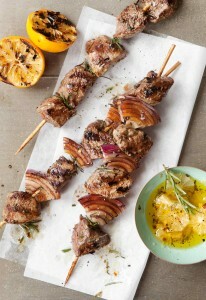 Spring is on it's way, keep your grill busy ..... grilling lamb is very, very delicious! I provide a manilla envelope filled with delicious recipes, cooking charts with all wholesale purchases. 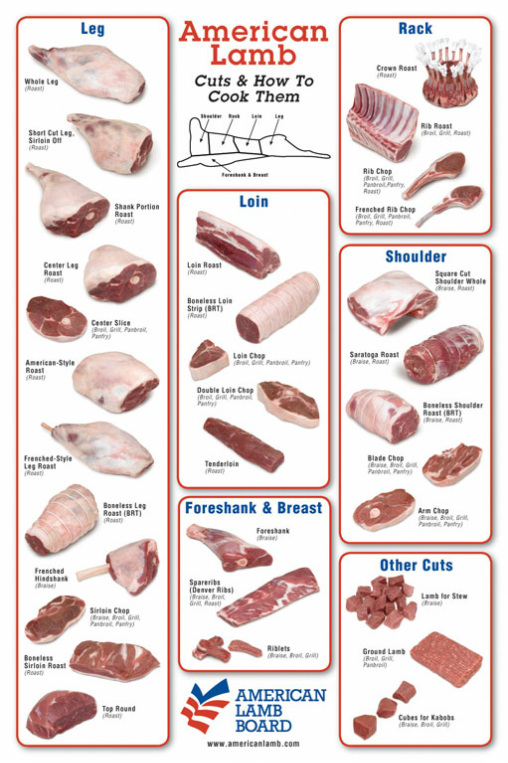 I also include a lamb chart & cut sheet! Leg (whole w/bone) - $11.00/lb. Leg (boneless, rolled & tied) - $13.00/lb. Rack of Lamb ( it requires two for a "Crown Roast" & it must be w/"French Cut") - $17.00/lb. Shoulder (boneless, rolled & tied) - $10.00/lb. Liver, Heart and/or Kidneys - $4.00/lb. Sausage (1 lb. packs) - $11.00/lb.